The Blackboard Learn Self-Service tool will be shut down as of February 16th, 2017. Its functions are moving to new, streamlined locations. Where Do I Manage my Bb Learn Enrollments? You can now provide users access directly from within the course or organization itself, provided you are a course instructor or organization leader. Where Do I Create Prep Areas? 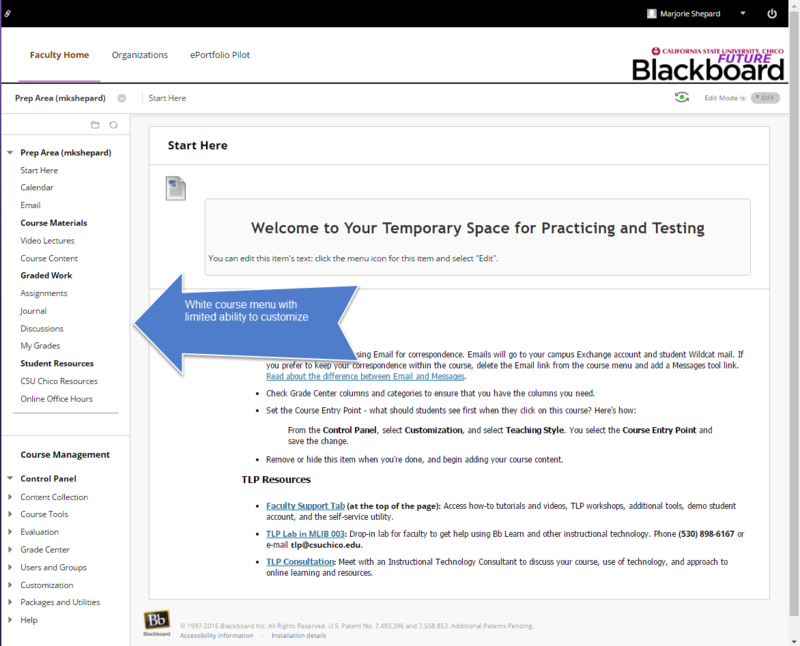 By default, each Blackboard Learn Faculty user has 5 prep areas. If you want additional prep areas, or you want to delete existing prep areas, you must submit a support request using the links below. Faculty, by now you have seen the new interface for Bb Learn and are preparing your courses for the spring semester 2017. If you have not yet noticed, there are a couple of bugs that you may not like. One is how you can “drag and drop” to reorder elements on a content page. It is not working as designed and we have complained loudly to Blackboard to fix it. Remedies are in progress and will be deployed as soon as ready. The Technology and Learning Program folks can help you now! See image below or come in for a visit, the basement of Meriam Library, room 003. Another bug is how the Gradebook does not fill the width of your computer screen. This is quite annoying. We are going to manipulate that setting so that it will fill the screen. Please make note of any other bugs you see and let us know so that we can pass them on to the Blackboard developers. Call us at 898-6167 or email TLP at tlp@csuchio.edu, and let us know. We are very happy that this new version meets accessibility requirements better than before. Your students will appreciate that, too! Chico State’s video management solution, Kaltura, has new features available! External media management tool: MediaSpace – that can be accessed separately from the LMS. Lecture Recording: CaptureSpace – a way to create online lectures, lab demonstrations, student presentations. There are a couple ways to get started with these new features. Schedule a consultation with one of Instructional Technology Consultants in the Technology and Learning Program to discuss ideas and use case. Sign-up for a hands-on workshop. The workshop provides users with an overview of the features available, along with how to create, manage, and distribute media. For more information, contact the Technology and Learning Program at 530.898.6167. Sign-up for a Kaltura Workshop. Links to Lynda.com are fixed within Bb Learn! CSU. Chico Faculty: using Lynda.com tutorials is a great source of help to our students. Earlier this fall the internal links to Lynda.com tutorials were not working properly, and we shared with you a work-around. The issue has been repaired, and now the shortcut links work great! If you need any assistance with this, don’t hesitate to contact the Technology and Learning Program (or TLP). We are located in the basement of Meriam Library, room 003. Come visit us, or call x6167, or email tlp@csuchico.edu. We are here to serve you and help simplify instructional activities for your students.